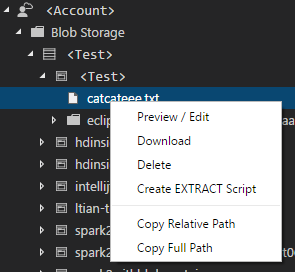 We are pleased to announce the integration of VSCode explorer with Azure blob storage. 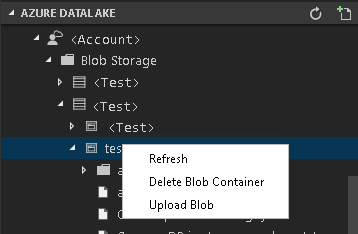 If you are a data scientist and want to explore the data in your Azure blob storage, please try the Data Lake Explorer blob storage integration. If you are a developer and want to access and manage your Azure blob storage files, please try the Data Lake Explorer blob storage integration. 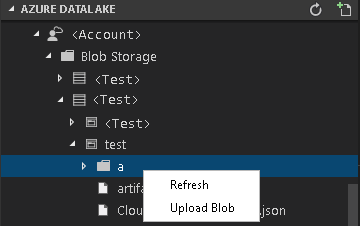 The Data Lake Explorer allows you easily navigate to your blob storage, access and manage your blob container, folder and files. Install Visual Studio Code and download Mono 4.2.x (for Linux and Mac). 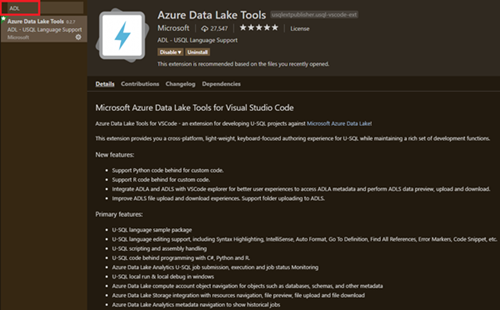 Then get the latest Azure Data Lake Tools by going to the VSCode Extension repository or the VSCode Marketplace and searching Azure Data Lake Tools.